At Medtec Europe from 13th to 15th March in Stuttgart, Germany, injection moulding machine manufacturer and automation expert ENGEL AUSTRIA will be demonstrating how to omit a complete manufacturing step in the production of disposable syringes, while at the same time saving raw materials. As cost pressure increases in medical technology, there is a trend towards a higher degree of process integration. The centrepiece of the highly integrated and highly automated production cell at trade fair booth 4414 in Hall 4 is an all-electric ENGEL e-motion 200/100 T injection moulding machine in clean room specification with a clamping force of 100 tonnes which will be producing disposable syringes including needles in a single process. To allow this to happen, the needles are separated and insert-placed into the 4x pilot mould by ZAHORANSKY by a linear robot driven by a servomotor. After overmoulding with a cyclic olefin copolymer (COC), the syringe barrels are taken off the mould by an ENGEL easix multiple axis industrial robot. Because the take-off step occurs in parallel to insert-placing of a new set of needles, the plant achieves extremely short cycle times. The integrated process is an innovation compared with legacy multiple step processes, which first manufacture the needle holder in an injection moulding step and then glue in the hollow needles. In practical applications, follow-up stations could be integrated into the production cell through to packaging of the ready-for-use syringes. 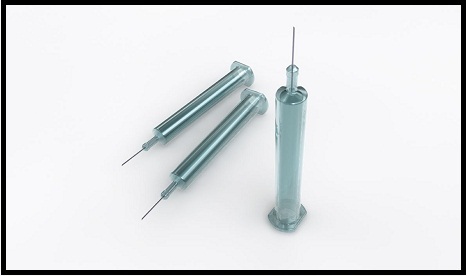 Because there is no need for glue, and the COC acts as a barrier, the application presented at Medtec is also suitable for manufacturing prefilled syringes, which have previously only been made of glass. “Prefilled syringes are a growth market”, emphasises Christoph Lhota, Head of Business Unit Medical with ENGEL AUSTRIA, “for two reasons: first of all, they reliably prevent errors in the medication dosage, and secondly they reduce the packaging overhead because the applicator is also the packaging”. ENGEL is presenting this exhibit in cooperation with system partners. Besides supplying the mould, ZAHORANSKY, Freiburg/Germany is also responsible for the system that separates and feeds in the needles. The ENGEL easix robot is based on a TX 90 by Stäubli Tec-Systems, Bayreuth/Germany. Transcoject, Neumünster/Germany is involved in the project as the plastics processor. This trade fair exhibit sees ENGEL and its system partners not just setting standards in terms of economy, but also with respect to ease of operation of the production plant. The multiple-axis robot control unit is fully integrated into the CC 200 control unit on the ENGEL injection moulding machine; in other words, there is no need for a Euromap 67 interface. This means that the robot can be controlled using the injection moulding machine control unit’s familiar simple instructions. Tasks that previously involved calling in a developer can now be handled by machine operating staff. To maintain the full feature scope, despite simpler controls, the control unit offers different user levels, from a simple view, to a fully object-oriented visualisation of the sequence. The fact that the machine and the robot share data storage is another advantage of control unit integration which both improves efficiency and ensures a greater degree of process reliability. Another trend in medical technology is towards large-scale, electrical machines which are also increasingly being used for multiple component technologies. “One factor driving this trend is the increasing use of large moulds with a large number of cavities for comparatively small articles with exacting precision requirements”, says Lhota. Maximum product safety, absolute cleanliness and precision, seamless documentation and traceability – no other branch sets greater requirements than medical technology. But just as important as the technical requirements is trust in the partner on the supplier side. This is why a separate business unit at ENGEL is solely dedicated to the users in medical technology. On the basis of its in-house clean room at the Schwertberg works and a series of resulting machine concepts for clean room use, ENGEL has acquired extensive experience and competence with clean rooms. In cooperation with renowned partners, ENGEL medical offers complex clean room system solutions from a single source – from the machine via automation, moulds and peripherals to the PDA system.